Almost as soon as Johnny Carson announced that he’d be retiring from The Tonight Show in 1992, established and aspiring members of Hollywood royalty began dropping by to pay their respects, while newspaper columnists waxed rhapsodic about Carson’s steady, unifying presence on television for 30 years. Never mind that just a few years earlier, the line on Carson was that he was aged and out-of-touch—outpaced regularly by his competitor Arsenio Hall, and even by his designated guest host Jay Leno, who back then was still a comedy icon, not a showbiz villain. That may explain the tinge of parental pique to Carson’s exit. His final shows were gracious and sentimental, but when Carson left the air, he largely stayed off the air. It was like he was teaching his critics a lesson: Don’t appreciate the old man? Fine. No more old man. No more jokes about Ed’s boozing and Doc’s ties. No more adorable conversations with elderly ladies toting unusual collections, or toddlers who’d won contests at state fairs. No more monologues setting the agenda for the national conversation. No more vaguely dirty nonsense punchlines, or lingering glares when a joke bombed. No more elaborately illustrated “More To Come” bumpers. And no more anniversary specials. I miss the anniversary specials most. As someone born eight years into the Carson era of The Tonight Show, someone who wasn’t allowed to stay up late enough to watch until it had been on the air for nearly two decades, Carson’s annual prime-time reminiscences were an integral part of my TV scholarship. Eventually, comedians began to make fun of the anniversary specials the way they were making fun of everything else about Carson and The Tonight Show. Garry Shandling produced a prototype of The Larry Sanders Show on Showtime in the form of a fake anniversary special, spoofing the era-signifiers and “wild” highlights. The Simpsons did the same, with Krusty The Clown as Carson. On Saturday Night Live, Dana Carvey riffed on the drunken anarchy of The Tonight Show in its ’60s and ’70s heyday, as reflected in those specials. But for me, sitting through the same clips year after year—of Carson getting peed on by visiting zoo animals, or Ed Ames lodging a tomahawk in a dummy’s crotch, or Dean Martin flicking ashes into George Gobel’s cup—was a crash course in late-night history, and a small sample of what I imagined to be a loaded cache of broadcasting gold. What I didn’t realize was that the reason I kept seeing the same clips every year was because The Tonight Show archive wasn’t loaded. The networks have rarely seen much replay value in non-scripted programming, so most of Carson’s ’60s output and a significant chunk of his ’70s work has been erased, outside of a few surviving tapes and kinescopes. A recent box set collects a handful of those (now heavily edited) broadcasts, a handful more are available MOD, and some others are available on YouTube or from other fan sources. But for a long time, the only extended sample of the ’60s Tonight Show that the general public had access to was an episode released on DVD as “Return To Studio One.” It’s a show from March 6th, 1969, recorded during one of Carson’s periodic visits to Los Angeles, before the show relocated there permanently in 1972; and it only survives because it was transferred to film for the Armed Forces Network. But even this film doesn’t capture the full show. In 1969, The Tonight Show ran for 90 minutes, and there are only 38 minutes of footage on the DVD. Even accounting for commercials, a lot is clearly missing. At one point, Carson even refers to a sketch that was part of the telecast, but not part of this package. The existing portion includes Carson’s monologue, a musical performance by drummers Buddy Rich and Louis Bellson, and snippets of interviews with Laugh-In’s Judy Carne and the legendary Bob Hope, who was meant to do a surprise drop-in, but ended up sticking around for the rest of the night. And it also includes the entirety of that infamous Dean Martin/George Gobel interview, which starts out loopy, then spins out of control. 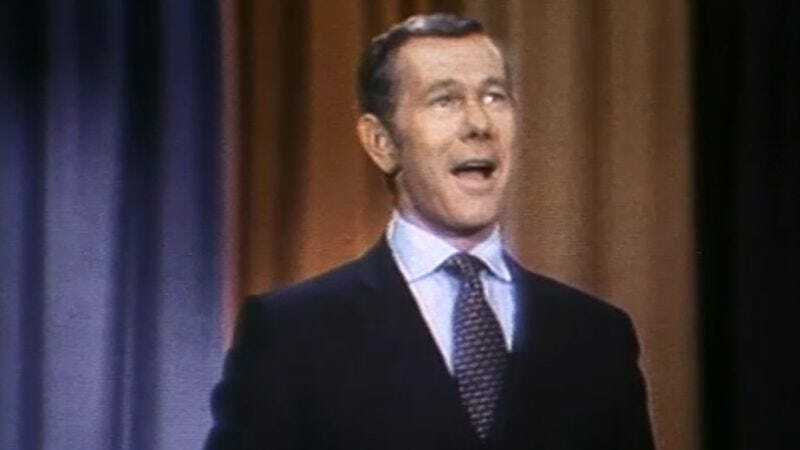 Though it’s only a fraction of the whole, preserved with little context or comment, the 3/6/69 show offers at least a hint at what The Tonight Show was like seven years after Carson took the helm. He was already a confident performer then, bantering easily with his guests and sidekicks, maintaining a conversational tone more common to a morning show or a radio show than to late-night. The pace of the show is unhurried—after all, they had more than an hour to fill—though Carson himself is quick-witted, tossing out clever ad-libs with impeccable timing. He runs through his jokes with almost no pause, save for the occasional double-take or smoker’s cough. As read, the jokes don’t really pop, and the references are so of-the-moment that they’re practically in an alien tongue at times. But much of Carson’s comic touch was in his delivery: how he hit the punchlines so hard that it almost didn’t matter what he was actually saying, and how he pivoted into the next joke without giving the audience much chance to dwell on the one before. The exception comes later in the monologue, when Carson frames a joke about Dean Martin’s drunken stupors as an anecdote that happened earlier that day, and then when the audience doesn’t laugh hard, enough Carson begins to repeat himself, getting the crowd to laugh at his persistence. Then, finally, before delivering his signature “I’m done with the monologue” golf swing, Carson takes a moment to talk more about the quirks of Los Angeles, and to rib Ed and Doc. The film of the 3/6/69 show then jumps ahead to the Rich/Belson performance, which Carson sets up as, “It’s gonna be crazy-time.” And he’s right. Even though 1969 was an especially loud, raucous era for popular music, it’s still astonishing to think that a network television show would give over a few minutes of airtime to what—strictly from a sonic point of view—amounts to untamed noise. Instead, they talk spontaneously about the difference between British and American figures of speech like “knocked up,” and at one point, Carson asks Carne “What are you up to?” as though he were genuinely curious. (And as though there had been no pre-interview.) It’s more like cocktail-party chitchat than a carefully orchestrated TV conversation. The episode really gets rolling when Bob Hope arrives. Prior to Hope’s arrival, Carson changes clothes, for reasons unexplained. In the next segment, Carson introduces Gobel, but Dean Martin comes out instead, holding a cup of something potent. Then Gobel arrives, and immediately breaks up the panel by insisting “Without me, your show tonight would’ve been nothing.” Gobel isn’t as well-remembered today as Hope, Martin, or Carson, though he should be. The George Gobel Show ran from 1954 to 1960, offering an innovative mix of sitcom-style sketches, musical performances, and monologues, all presided over by Gobel with a mix of self-deprecation and wisenheimery. On the 3/6/69 Tonight Show, Gobel works some pieces of his nightclub act into his back-and-forth with Carson, joking about how he spent his Air Force service in World War II stationed in Oklahoma, because “That’s evidently where they needed me.” (He adds, “I’m not bragging, but not one Japanese aircraft got past Tulsa.”) Gobel is treated as one of the gang by the more high-powered showbiz types on stage, and gets some unintentional laughs from the audience just by waving his drink around—a drink that Martin flicks his cigarette into whenever Gobel turns toward Carson. According to Gobel, it’s Martin’s fault for getting him drunk backstage in the first place. After the mayhem hits a peak, the episode winds down somewhat anti-climactically, as Carson invites out Robert Wagner and Carol Wayne—who appeared in the aforementioned missing sketch—to say a quick hello. Wayne, who played the designated bombshell in “Mighty Carson Art Players” routines for about two decades, eventually got involved with drugs, and died mysteriously in Mexico in 1990. But here, she’s still young, and playing to type as the squeaky-voiced ingénue, giving her unbridled approval to the institution of marriage. Meanwhile, in the background, Martin gets bleeped after he takes the Lord’s name in vain—“You old name-dropper you,” Carson sighs—while Gobel gropes Carne. And so the episode ends, still in the thick of crazy-time. The most famous line from the 3/6/69 Tonight Show—the one that made it into nearly every anniversary special, right alongside the shot of Martin’s cigarette edging toward Gobel’s cocktail—comes when Gobel takes a look at Martin and Hope and says, “Did you ever get the feeling that the world was a tuxedo and you were a pair of brown shoes?” It’s an apt joke, especially given that Hope, Martin, and Carson are far better known these days than Gobel. And yet it’s not like Gobel seemed out of place that night. Hope and Martin embraced him as a peer, even talking about him when he’s offstage. As for Carson… well, one of Carson’s most celebrated gifts was his ability to treat the biggest stars and his less-celebrated guests more or less the same. It was part of his carefully crafted persona as the middleman between the viewers at home and the glamorous world of show business. Carson made political jokes just about every night on The Tonight Show, but never betrayed any specific ideology. He’d frequently talk with McMahon in the early segments of the show about a book he’d just read or a documentary he’d seen on PBS, coming across to Ed and to the viewers as a man genuinely engaged with the world. Carson wrote his thesis at the University Of Nebraska on comedy, and conveyed his appreciation for the art of the funny both in his conversations about comedy legends and in his enthusiastic laughter whenever a young comic came on and killed. And though Carson guarded his privacy and rarely gave interviews, whenever his personal life made headlines—whether because of a contract dispute, a divorce, or his son’s death—he’d talk about it on the air, on his home turf. So which was Carson, the tuxedo, or the pair of brown shoes? That’s the eternal question when it comes to late-night talk-show hosts. Do viewers tune in to watch the host, or to see the Hollywood actors who drop by to talk up their new movies? If Kristen Stewart sits down with David Letterman, who’s really the bigger star? Who defers to whom? Does it really matter when these hosts retire, given that there’ll always be another eager comedian willing to usher the celebrities of the day on and off the screen between sketches and one-liners? What’s always been fascinating about the ’60s and ’70s era of show business is that it was wedged between the heyday of the Hollywood studio system and the Lucas/Spielberg blockbuster age, so the stakes seemed a lot lower, and the stars behaved accordingly. Watching The Tonight Show—or even The Match Game— back then meant being allowed access to a community where everybody appeared to know and like each other. (And where they all drank together. Constantly.) Carson was the ideal host for those times, because even though he reportedly didn’t socialize much, he came across on camera as though he were everybody’s friend. But for me, missing Carson’s gifts as an entertainer is so inextricably tied to missing the vibe of that era that I sometimes can’t pinpoint exactly which I’m most nostalgic for. Moreover, with Carson now dead and his broadcast legacy either gone for good or locked away, it’s getting harder every year to piece together the full story of who he was and what he meant to television and to the culture at large. Even the occasional Tonight Show DVDs that get released—like “Return To Studio One”—typically arrive with no commentary, interviews, or essays to explain what we’re seeing. And it’s not like NBC does anything to keep the legacy alive, the way they did every year when Carson was still on the air. It’s perhaps because of this selective history that media pundits made so much of the recent late-night hubbub—with Jay Leno taking The Tonight Show back from Conan O’Brien and the two feuding on the air. As entertaining as the Leno/O’Brien flare-up was, it was really nothing new. Late-night hosts have been airing out their grievances with their networks and their peers almost from the moment the format was invented. The first NBC late-night series, Broadway Open House, was reportedly a hotbed of backstage intrigue, as host Jerry Lester tried to keep his co-stars in their place by making outrageous demands of the network. When The Tonight Show launched with Allen in 1954, the host complained about the length—which was then 105 minutes a night—on the very first broadcast. When Paar took over, he’d get angry and emotional on the air almost nightly, working through his grudges with other entertainers. And Carson frequently held NBC hostage, demanding a reduction in his airtime, relocation to L.A., and additional vacations… he really dictated everything but the appointment of his successor, which the network famously botched. Comedian Patton Oswalt recently wrote a thought-provoking, persuasive Wired essay in which he argued (among other things), “When everyone has easy access to their favorite diversions and every diversion comes with a rabbit hole’s worth of extra features and deleted scenes and hidden hacks to tumble down and never emerge from, then we’re all just adding to an ever-swelling, soon-to-erupt volcano of trivia, re-contextualized and forever rebooted. We’re on the brink of Etewaf: Everything That Ever Was—Available Forever.” To some extent, I side with Oswalt, inasmuch as I recognize the danger of revering and cannibalizing the past until all we have to look forward to are 3D movie versions of car bingo and Captain Planet. But there’s also a danger in treating each new development in the entertainment world as something truly original, when it’s often covering well-trod ground. Because the truth is that everything that ever was isn’t available, at least not now. Significant portions of our showbiz past are gone for good, or locked away by people who see no profit in releasing it, but who will file cease-and-desist orders on anyone who tries to sneak it online. Our pop-cultural history fades, as entertainers retire and the people who remember watching them die off. We’re left with fragments. Hints. Dispatches from another time that get increasingly difficult to decode. One day, these people who were so much a part of the backdrop of our lives say their last goodbyes. And there is no More To Come.